TUCSON, Ariz., Oct 05, 2017 (SEND2PRESS NEWSWIRE) -- The Arizona Wine Growers Association today announced its 2017 lineup of vineyards for the Festival at the Farm, Saturday, November 11. The event will offer various wine tastings, displays and food from Arizona restaurants and retailers. Discussions will focus on how wine growers engage customers in their brands and enhance the shopping experience through innovation, technology and techniques for meeting evolving consumer preferences. 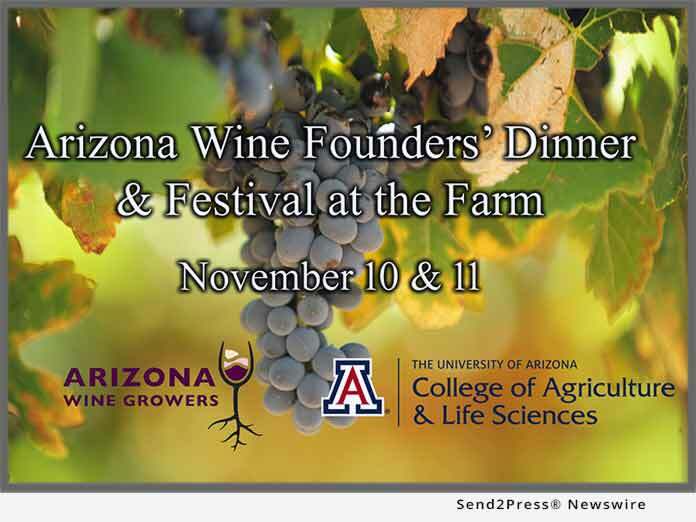 A gala, the Arizona Wine Founders' Dinner, will kick off the festival on Friday, November 10 from 6-pm at the University of Arizona's Student Union, where four founders will be honored for their dedication and service to the industry. The festival will be held November 11 from 11 a.m. - 6 p.m. at the UA's College of Agriculture and Life Sciences' "Farm," 4101 N. Campbell, Tucson, AZ. This inaugural event will serve as a forum for emerging ideas in a setting that fuses passionate businesses and customers. Details on the event, including a complete program, are posted on Arizona Wine Growers Association http://arizonawine.org/, with pages on Facebook.com (facebook.com/ArizonaWine/) and Twitter at @AZWineries. "We hope to have robust conversations around the new and dynamic directions of an industry that leads consumer preferences. The pace of change has never been as rapid as it is today. Leading wine retailers and brand marketers are looking differently at how they attract and retain customers, and how they develop the talent and technology needed for the future," said Brain Predmore, President Arizona Wine Growers Association. "This year's event will help to raise awareness of the vibrant Arizona Wine industry by showcasing our wines and interacting with our attendees. In addition, we hope to raise money for the Arizona Wine Library and Research Center." Proceeds from the festival will go to creating the Arizona Wine Research Library at the University of Arizona. "The College of Agriculture and Life Sciences, and its Norton School's Retailing and Consumer Sciences program, especially, is proud to partner with another Arizona industry that is transforming our food and tourism landscape," said Shane Burgess, UA vice president of agriculture, life and veterinary sciences, and Cooperative Extension. Tickets are available on Eventbrite at https://www.eventbrite.com/e/festival-the-farm-founders-dinner-nov-2017-tickets-37572597651 for the Founders Gala and the Wine Festival. For more information on attending the event, visit https://www.facebook.com/ArizonaWine/ and follow to the registration page. Or email Mike Pigford at events@arizonawine.org . The Arizona Wine Growers Association (AWGA) serves grape growers and winemakers in Arizona, allying its members for representation, promotion and education. The association strives to advance with integrity, the sustainable growth and production of authentic Arizona-grown wines and increase awareness of the Arizona industry, which includes 104 licensed and bonded wineries throughout the state. The John and Doris Norton School of Family and Consumer Sciences at the University of Arizona prepares the next generation to solve the global challenges of individuals, communities and the changing marketplace. We provide educational enrichment, professional development, world-class events and hands-on learning opportunities, ensuring that our graduates have the skill set, training and preparation to lead their companies. Arizona Wine Growers Association, General Editorial, Regional Events, Travel and Tourism, TUCSON, Ariz.